Single molecule microscopy approch provided novel insights into nuclear transport. Goryaynov, A., Sarma, A., Ma, J., Yang, W. Single-Molecule Imaging of Nuclear Transport. J. Vis. Exp. (40), e2040, doi:10.3791/2040 (2010). The utility of single molecule fluorescence microscopy approaches has been proven to be of a great avail in understanding biological reactions over the last decade. The investigation of molecular interactions with high temporal and spatial resolutions deep within cells has remained challenging due to the inherently weak signals arising from individual molecules. Recent works by Yang et al. demonstrated that narrow-field epifluorescence microscopy allows visualization of nucleocytoplasmic transport at the single molecule level. By the single molecule approach, important kinetics, such as nuclear transport time and efficiency, for signal-dependent and independent cargo molecules have been obtained. Here we described a protocol for the methodological approach with an improved spatiotemporal resolution of 0.4 ms and 12 nm. The improved resolution enabled us to capture transient active transport and passive diffusion events through the nuclear pore complexes (NPC) in semi-intact cells. We expect this method to be used in elucidating other binding and trafficking events within cells. At least one week in advance, start a fresh culture of HeLa cell line from a stock by thawing at 37°C and putting in a 25 cm2 culture flask with 5 mL media, Incubate the cells at 37°C within 5% CO2 incubator for 24 hours and split it at least 3 times in order to provide an optimal condition for the cells. However the cells should not be split more than 20 times due to proclivity of their growth rate to slow down significantly. HeLa cells were previously genetically engineered to have GFP (green fluorescent protein) fused to the nuclear envelope pore membrane protein POM 121. It is necessary for a precise localization of the nuclear envelope. One day before the experiment, cells intended for a single molecule experiment should be spread on an autoclaved cover slip placed in a sterile Petri dish. The coverslip should be suspended in DMEM (Dulbecco's modified Eagle's medium, Grand Island, NY) supplemented with 4.5 g/L glucose, 862 mg/L GlutaMAX-I, 15 mg/mL phenol red, 100 U/mL penicillin, 100μg/mL streptomycin and 10% newborn calf serum. The volume of a culture should be 1mL per cover slip, uniformly distributed all over the surface. These Petri dishes with the cover slips then are placed into the CO2 incubator and kept for 24 hours prior to the experiment. In order for a cell culture to be suitable for a single molecule experiment the cell confluency on the cover slip should not exceed 70% to provide a good freedom for wash buffers and proteins of interest undergoing the nuclear transport. On the day of the experiment, flow-chambers were constructed by adding a top cover slip together with two lines of silicone grease as spacers. It is essential to make sure the cells don't dry out during the preparation. We usually prefer to have two chambers made on one cover slip to allow two different conditions for the experiment. The top cover slips small slivers of glass cover slip cut with a diamond knife to be approximately 6mm2 were placed upside down on a Kimwipe. Two lines of silicone grease were finely placed along he edges of the cover slips with a 10 mL plastic syringe that had a pipette tip tightly attached with Parafilm to control the size of the grease bead. The HeLa-cell coated slide was then drip-dried and mounted with grease as glue in a home-machined aluminum frame - temper, which served to hold the slide in the microscope sample holder. The top cover slips with the two lines of grease were then picked up with a pointed tweezers and then inverted over the cell-coated slide, forming a flow chamber. A relatively firm attachment was made by pressing gently over the greased edges of the coverslip. Since we made two separate chambers on one cell-coated slide it is essential to provide a good sealing to prevent cross-contamination. For this purpose several lines of the silicone grease were applied in between the chambers from the top to the bottom of the slide to seal the apart. Several lines of grease were also put on the outer sides of the chambers. DMEM media was then added to the flow chamber to prevent the cells from drying out. Solution flow was promoted by a small piece filter paper to absorb the fluid out of the exit side of the flow chambers. With steady hands, solution could be added simultaneously by micropipette to one side of the flow-chamber with one hand, and absorbed on the other side by filter paper. After the construction, the bottom of the slide was washed with a wetted cotton-tipped swab, twice with water, and then twice with 100% ethanol. Once the slide is mounted on the microscope, the cells washed with 2 X 25 μL import buffer (20 mM Hepes, 110 mM KOAc, 5 mM NaOAc, 2 mM MgOAc, 1 mM EGTA, pH 7.3). The cells then permeabilized for ~ 2 minutes with 2 X 25 μL 40 μg/mL digitonin in import buffer and washed again with 2 X 25 μL import buffer (20 mM HEPES, 110 mM KOAc, 5 mM NaOAc, 2 mM MgOAc, 1 mM EGTA, pH 7.3) supplemented with 1.5 % polyvinylpyrrolidone (PVP; 360 kDa). It may be necessary to monitor the permeabilization in a real time using the bright field. PVP was included in all import buffer solutions after digitonin to prevent osmotic swelling of nuclei. The intact nucleus, together with a controlled cytoplasmic environment, provides a greatly simplified transport system that allows us to elucidate the complicated nuclear transport step by step. Previous ensemble and single-molecule experiments that conducted in the system have provided great insights in nuclear transport. By means of a conventional bacterial transformation the special strains of E.coli (JM109) were engineered in order to overexpress the genes responsible for production of the abovementioned proteins of interest and are kept in stock at -80°C. (For NLS-2xGFP we used pTrcHisB vector by Invitrogen). A loopful or ~50 μL of frozen stocks of fluorescent or cargo protein expressing E.Coli cells are transferred to 5mL of LB media with addition of 5μL of ampicillin (U 1000) and grown aerobically with shaking overnight at 37°C at 225 rpm. After 24 hours 500 μL of saturated culture is transferred into 500 mL of LB media and shaken in the 37°C incubator for 5-6 hours following the addition of 250 μL IPTG (Isopropyl _-D-1-thiogalactopyranoside) and incubated for another 5-6 hours. It is necessary because IPTG is a lactose metabolite that triggers transcription of the lac operon, where the lacZ gene is replaced with the gene of interest and IPTG is then used to induce gene expression. The culture is then spun in the cooling high-speed centrifuge at 12000 rpm for 15 minutes and the supernatant is discarded. Cells are then resuspended in 40 mL of CelLytic B (CelLytic B results in rapid and efficient extraction of proteins that are suitable for affinity purification and analysis.) The volume should be based on 10 mL per 1 gram of a pellet. 28 μl of mercaptoethanol is added to break disulfide bonds and 400 μl of phenylmethanesulphonyl fluoride to deactivate proteases from digesting proteins of interest after cell lysis. A "protease cocktail" is also added (400 μL of 0.2 mg/mL pepstatin A. 400 μL of 0.2 mg/mL leupeptin; 400 μL of 2 mg/ml trypsin inhibitor) to ensure that protein extracts do not degrade before analysis for targets of interest. We then add 400 μL 1M imidazole, is used to elute tagged proteins bound to Ni ions attached to the surface of beads in the chromatography column and 1mM of DNase I, used to degrade unwanted single- and double-stranded DNA into 5 phosphodinucleotide and oligonucleotide fragments. Stir the mixture in dark on ice for 30 minutes to allow an adequate time for the reaction, spin at 10000 rpm for 60 minutes in the cooling centrifuge. Harvest the supernatant and in preparation for chromatography perform the infusion with Ni-NTA (nickel-nitrilotriacetic acid Superflow by Qiagen) by spinning in microfuge centrifuge tubes at max speed for 3 minutes and washing with lysis buffer, repeating spinning and washing until the mixture is clear of any blue tint. Stir the resultant mixture slowly in a dark container on ice for 60 minutes. Prepare the SDS-PAGE polyacrylamide gel and prepare our samples by mixing 4 μL of a fraction and 1 μL of 5X SB (300mM Tris 6.8, 25% BME, 10% SDS, 50% glycerol). For the standard we used 100 kb DNA ladder by Invitrogen. Before loading we boiled our samples for 5 minutes. After loading we ran the gel at 120V for 60 minutes. Then we stained, destained and finally dried in a special gel drier for 2 hours at 80C. We then viewed the results on the gel and located the fractions that yielded the best result. Depending on the protein of our interest, the bands should be located respectively to the size of a protein. This fraction should be selected for further protein purification with MonoQ and Superdex 200 (Amersham Pharmacia). Concentration is performed by spinning the most concentrated fractions in Nanosep filter with a pore size of 10K at 14 rpm for 5 minutes, washing it with elution buffer every time. It is necessary to determine the final protein concentration utilizing the BSA assay for further protein labeling procedure. The intrinsic green fluorescence of NLS-2xGFP cannot be utilized for single molecule imaging of nuclear transport due to its poor photo-stability and overlapped spectrum with cell autofluorescence. Thus, we label the cargo molecules with an excess of a cysteine-reactive organic dye (Alexa555 or Alexa 647 maleimide from Molecular Probes) for 2 hours at room temperature in 50 mM sodium phosphate, 150 mM NaCl after reducing with TCEP tris (2-carboxyethyl) for 20 minutes. Reactions were quenched with 2-mercaptoethanol, and the protein solutions were dialyzed to remove the free dye. Our microscope set up includes an Olympus IX81 equipped with a 1.4 NA 100x oil-immersion objective (UPLSAPO 100XO, Olympus), a 35 mW 633 nm He-Ne laser (Melles Griot), a mercury lamp with GFP filter set up, an on-chip multiplication gain charge-coupled device camera (Cascade 128+, Roper Scientific) and the Slidebook software package (Intelligent Imaging Innovations) for data acquisition and processing. An optical chopper (Newport) was used to generate an on-off mode of laser excitation. GFP and Alexa647 fluorescence was excited by a mercury lamp and 633 nm laser respectively. The green and red fluorescence emission was collected by the same objective, filtered by a dichroic filter (Di01-R405/488/561/635-25x36, Semrock) and an emission filter (NF01-405/488/561/635-25X5.0, Semrock) and imaged by an identical CCD camera. In single molecule experiments, we enable the fluorescence photobleaching time of the single cargo molecule to be longer than transport time. To determine the photobleaching time, 0.1 nM cargo molecules are plated on a glass cover slip and become immobile after 30 minutes due to non-specific absorption. Then, the time course of the fluorescence is measured. Depending on the protein of interest photobleach times will be different based on the number of cysteins capable to react with maleimides, therefore the illumination intensity and illumination area should be adjusted in order not induce a preliminary photobleaching and insure that cargo molecules labeled with Alexa 647 display fluorescence for longer than the cargos interact with NPCs. For import experiments in permeabilized cells, the cargo and essential transport cofactors were added together. Typical import cargo reactions contained 1 mM GTP, 0.5 μM Importin-, 0.5 μM Importin- 1, 2 μM Ran and 1 μM NTF2 for facilitated transport and 0.1 nM of 10KDa Dextran for passive transport.. Fluorescent cargo concentrations were > 100 nM in bulk experiments, and ~ 100 pM for single molecule assays. At these concentrations, >99% of the cargo was expected to form complexes with Importin and Importin . Transport rate was monitored by epifluorescence (if only relative rates were important) or confocal fluorescence microscopy (if absolute rates were desired). First the position of the nuclear envelope was determined by wide-field epifluorescence microscopy by engaging a HBO mercury lamp with a set of GFP filters to take a picture of the NE. The pixel intensities within a row or column are approximately perpendicular to the NE were fit with Gaussian. The peak positions of the Gaussian for a particular set of pixel intensities was considered the NE position for that row and column. The peak positions of a series of such Gaussians were then fit with a second-degree polynomial, yielding the path of the NE within the entire image. Once the NE is localized, it is essential to get rid of all autofluorescence utilizing a 633 nm He-Ne laser until it is completely photobleached, usually over 60 seconds is sufficient. Sample molecules should then be kept in a 1.5% solution of PVP and the mixture added to the flow chamber in a volume of 25 L and then dragged through the chamber applying a wick of filter paper. An utter care should be taken upon addition of the import cargo proteins to the permeabilized cells right after the nuclear envelope localization since the focus can be easily disrupted by any vigorous movement. As soon as the cargo molecules are added, 633 nm He-Ne laser was used to illuminate the transport trajectories of transiting molecules. An optical chopper (Newport) should be engaged at approximately 5 Hz to avoid the photobleaching due to a high power density of the laser, as well as to allow a new portion of non-photobleached single molecules to approach the NE. A series of videos of single molecule translocations should be taken with a high-speed CCD camera that can go up to 2500 Hz. 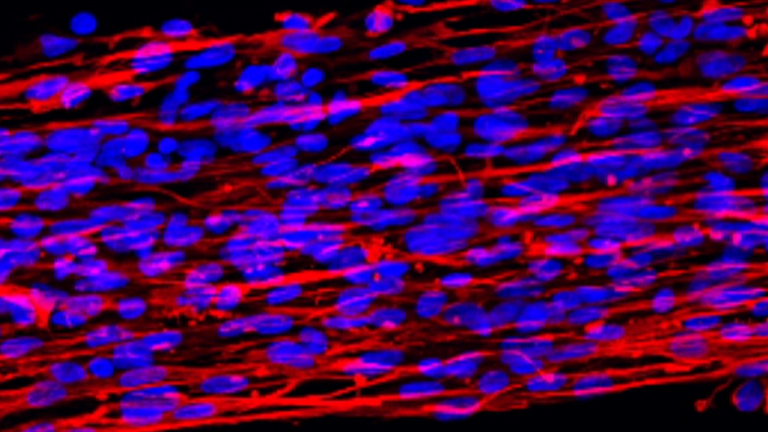 Performed correctly, our protocol allowed us to collect a series of videos demonstrating the translocation of single cargo molecules interacting with the nuclear pore complex in permeabilized HeLa POM 121 cells. (Fig 1). We set out to image and track the transient transport steps of dextran molecules through the NPC in digitonin-permeabilized HeLa cells stably expressing GFP-POM121. Cells were incubated with low concentrations of the labeled dextran molecules. The equatorial plane of the nucleus was brought into focus with a clear image of green ring of GFP fluorescence excited by a 488-nm mercury lamp light. A long-time exposure of GFP-NE enables us to obtain an excellent signal-to-noise (SNR) ratio to localize the middle plane of the NE. Previously 10 kDa dextran molecules were found to diffuse through the NE within approximately 2 ms with a spatial resolution of about 20-40 nm by a detection frame rate of 500 or 1000 Hz. Such a spatiotemporal resolution allows capture of only one to two diffusion steps of dextran molecules through the NPC which is not enough to elucidate more spatial information for passive diffusion. To capture more fine steps of dextran molecules within the NPC with a better spatiotemporal resolution, we have conducted two major improvements: (i) to adapt a faster detection frame rate of 2500 Hz to capture more fine diffusion steps; and (ii) to employ a higher illumination optical density to excite more photons from single molecules to obtain a higher spatial resolution. These improvements enable us to capture multiple steps of transient diffusion of alexa647-labeled dextran molecules across the NE by a 633-nm laser light at irradiance of 100 kW/cm2 with a spatiotemporal resolution of 12 nm and 400 ms.
As shown in Figure 1, a series of still images of typical transport events of dextran molecules were recorded. By tracking the spatial trajectories of individual transiting dextran molecules, the fine steps of diffusion through the NE were distinguished. We found that there are approximately 30% of interaction events with the NE have recognized originating and destination compartments. Among them, dextran molecules moving from the cytoplasm to the NE have two destinations: end in the nucleus after diffusing through the NE or move back to the cytoplasm after interacting with the NE The similar situations occurred for export events: dextran molecules starting from the nucleus enter the cytoplasm or diffuse back to the nucleus after interacting with the NE. Such image series contain information on the spatial position of the single molecules with regard to the NPC, as well as temporal information on the dwell time of the molecules through the NPC. By analyzing the trajectories of dextran molecules around the area of NE, the transport time, efficiency and entrance frequency can be determined. The transport time in our work can be identified as the import or the export time. They were defined as the average dwell time of dextran molecules within the NPCs that undergo the import or export. The import or export efficiency was defined as the percentage of the complete import or the export events over the sum of the complete and abortive events. The import or export entrance frequency refers the number of molecules interacting with the NE during a second. Figure 1. Selected video frames of typical transport events of dextran molecules through the NE. (A) A cytoplasm-to-nucleus event. A single dextran molecule (red spot) started from the cytoplasm, interacted with the NE (green pixel line), and ended in the nucleus. The trajectories of the event (blue lines and open dots) were determined and superimposed with the NE (black line). 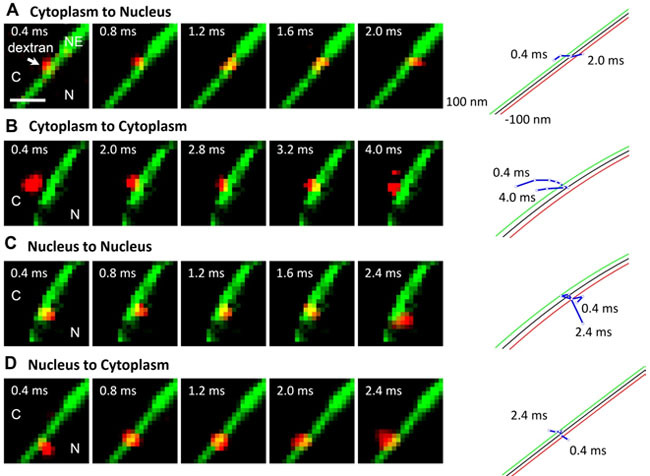 The green and red lines represent 100 nm-distance from the NE on the cytoplasm and the nuclear side. C, the cytoplasm. N, the nucleus. Scale bar: 2 mm. (B) A cytoplasm-to-cytoplasm event. (C) A nucleus-to-nucleus event. (D) A nucleus-to-cytoplasm event. Care must be taken to insure a proper colocalization of NE and single molecules during the experiment. It is also important to provide a high signal noise ratio, especially when the signal is low due to poor labeling or photobleaching. Localization precision is limited by background noise (arising from out-of-focus fluorescence, CCD readout noise, dark current and other factors). This project was supported by the Research Capacity Enhancement Grant (Bowling Green State University). Ma, J., Yang, W. Single Molecule Snapshots of Three-Dimensional Distribution of Transient Interactions in Nuclear Pore Complex. Proc. Natl. Acad. Sci. USA. Forthcoming (2010). Sarma, A., Goryaynov, A., Yang, W. Single Molecule Imaging of the Calcium-Regulated Nuclear Pore Permeability. Forthcoming Forthcoming. Yang, W., Musser, M. S. Visualizing single molecules transiting through nuclear pore complexes using narrow-field epifluorescence microscopy. Methods. 39, 316-328 (2006). Yang, W., Gelles, J., Musser, M. S. Imaging of single-molecule translocation through nuclear pore complexes. Proc. Natl. Acad. Sci. USA. 101, 12887-12892 (2004).